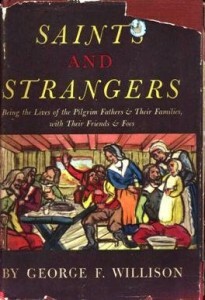 This 1945 history of the Pilgrims is more a collection of the individual biographies of those who settled the Plymouth Plantation and later the Boston Puritans. The “Saints” were those Pilgrims of like faith (to whom William Bradford gave this title) and the “Strangers” were those adventure seekers or ship mates who traveled with them on the Mayflower. Ironically dismissing first hand accounts, Willison is critical of Bradford’s reports, comparing them to a few contemporary letters but more to much later writing. He does, however, give great credence to the faith of the Pilgrims which saw them through tremendous odds.